The “St. 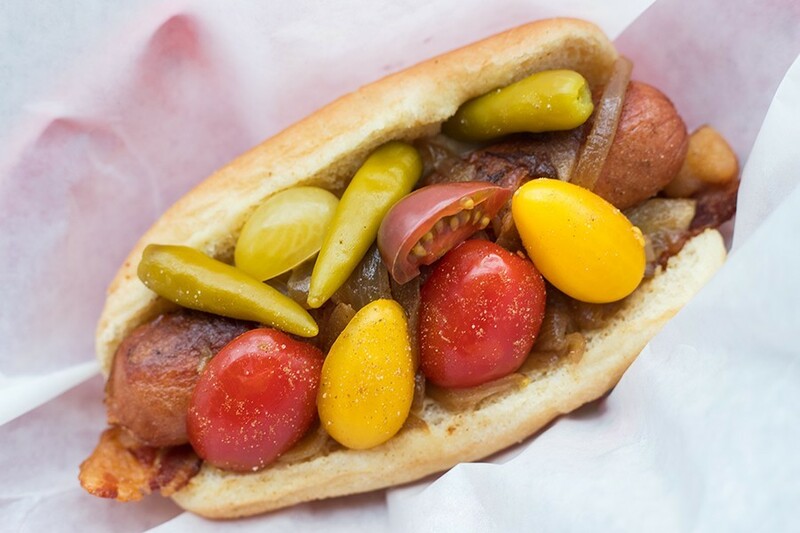 Louis” dog features Provel, bacon, caramelized onion, tomato, sport peppers and celery salt. 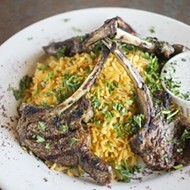 7293 Olive Boulevard, University City; 314-776-9225. Mon.-Sat. 11 a.m.-8 p.m. (Closed Sundays.) "New Yorker" hot dog $6; Double Angus burger with cheese $7.75; Grilled steak sandwich $9. Mike Eagan has been in fine dining since he was a sixteen-year-old dishwasher at Charlie Gitto's. He went on to Bon Appetit Catering and eventually the esteemed kitchen at Cardwell's in Clayton, where he served as executive chef for ten years, creating dishes made for china plates and white tablecloths. Yet if you ask Eagan what kind of cuisine really gets him going, his answer might surprise you. "Hot dogs," Eagan says without hesitation. "I have hot dogs in my blood." Though Eagan made his career in upscale kitchens, he found his culinary passion in, of all places, Home Depot, thanks to the steel hot-dog carts inside its front vestibules. There, Eagan spent his days searing up sausages and garnishing them to order for hungry hardware shoppers, helping Catherine Carroll run her slew of CC's-branded carts around town before eventually setting up his own stand, Double E Dogs, inside the Sunset Hills store. 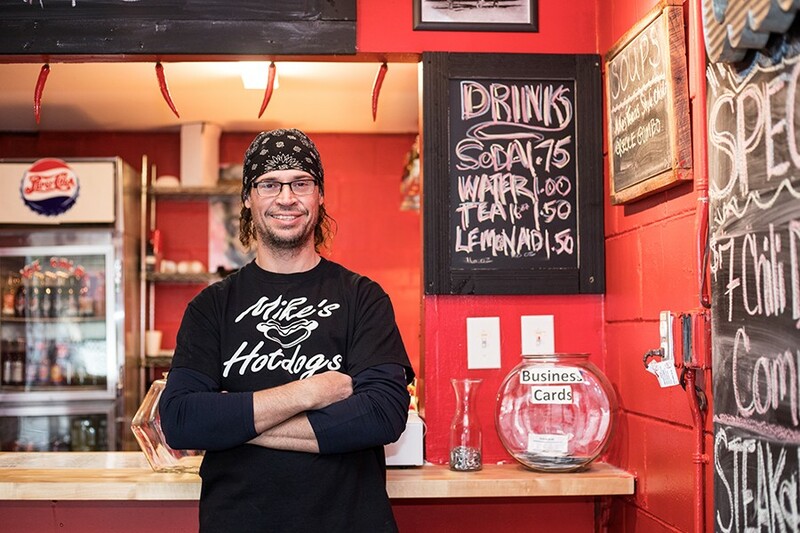 Chef-owner Michael Eagan has a fine-dining background, but fell in love with hot dogs. Since his Double E days, Eagan has gotten back into the more formal side of the restaurant business. 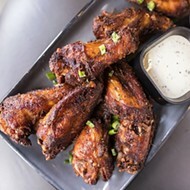 In addition to his tenure at Cardwell's, he owned his own restaurant, the since-shuttered Park West Grille, and helped open Kirkwood Brewhouse, where he was executive chef until he decided again to branch out on his own. 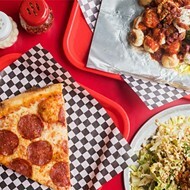 That happened this past August, when Eagan opened Mike's Hot Dogs, a humble fast-casual restaurant on the corner of Midland and Olive in University City. Inspired by his love of hot dogs, Eagan decided to embrace all that is possible with fast food, bringing a chef's sensibility to it — and having a good time in the process. The blues-heavy soundtrack and 1950s touches give the space a nostalgic feel. At Mike's Hot Dogs, Eagan evokes a 1950s nostalgic vibe without turning the space into a caricature. 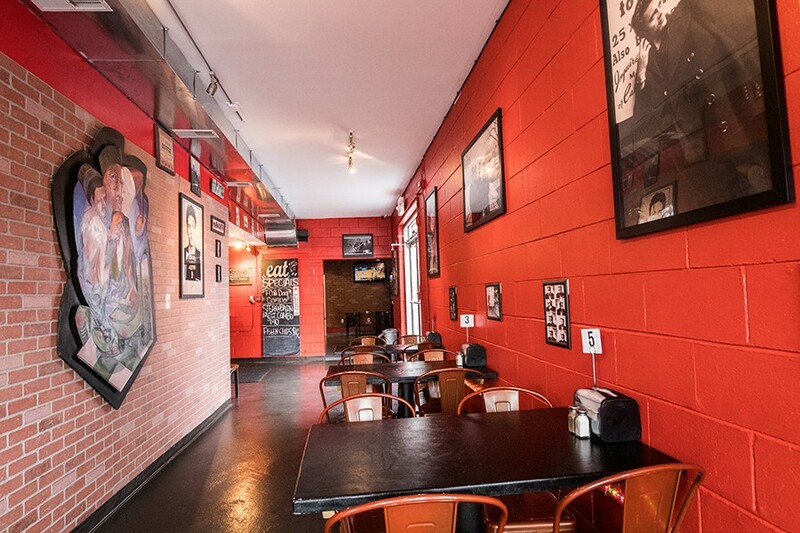 Red-painted cinder-block walls are adorned with black-and-white vintage photographs of various silver-screen stars, such as James Dean and Marilyn Monroe. 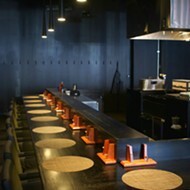 The room is simply appointed with black painted tables and chairs and a single red-and-black leather half-booth. The order counter is around the back, making it the first thing you see when you enter from the restaurant's side parking lot. In the rear of the building, there is an overflow dining room that Eagan hopes to convert to a bar as soon as soon as the restaurant gets its liquor license. 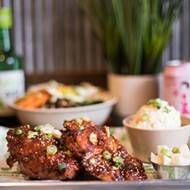 You can tell Eagan is ready for that final piece to fall into place by the way he cranks up the restaurant's sound system, filling the room with a blues-heavy soundtrack that gives the otherwise sparsely appointed space its character. B.B. King may be wailing away through the speakers, but if he were eating Eagan's food, he'd be singing a sunny little ditty. How could anyone be down when noshing on such whimsical offerings as the "St. Louis" dog, a messy, over-the-top homage to the Gateway City? A large Angus beef dog is smothered in molten Provel, bacon pieces and caramelized onions. By itself that might be too rich, but Eagen mitigates the fat with halved grape tomatoes, sport peppers and a dash of celery salt. It's a delightful mess, yet the way he balances the flavors makes you understand the thought behind them. He's not just trying to be extreme. The “Volcano” is topped with peppered bacon, hot sauce, jalapeno aioli, chopped onions, jalapenos, sport peppers, seared pineapple and celery salt. The "Volcano," another wild concoction, features the same beef dog, though this time it is split down the center and charred on the outside, giving it a more robust, meaty taste. It could be a heat bomb of a dish, with layer upon layer of spicy toppings including jalapeños, hot sauce, peppered bacon, sport peppers and jalapeño aioli. However, Eagan adds seared pineapple, and as it blends with the dog's fat, the fruit's sweet juice mitigates the heat. You might also think that putting cream cheese on a hot dog would make it overwhelmingly rich, but that addition proves the highlight on the "California." Fresh tomatoes, avocado and cucumber slices adorn the frank, offering a contrasting refreshment to the cheese and meat's richness. The result is a surprisingly bright — dare I say light? — offering that proved my favorite of all the specialty dogs. Eagan is clearly having fun with the wacky condiment combinations, but by no means is he using the accoutrements to make up for a lack of quality. The hot dogs, made locally by Ferguson's El Ray Cooked Meats, are just as good when they are allowed to shine with only minimal adornment. The simple preparation of the "New Yorker" — just sauerkraut, caramelized onions and spicy mustard — shows the beauty of a classically dressed dog. 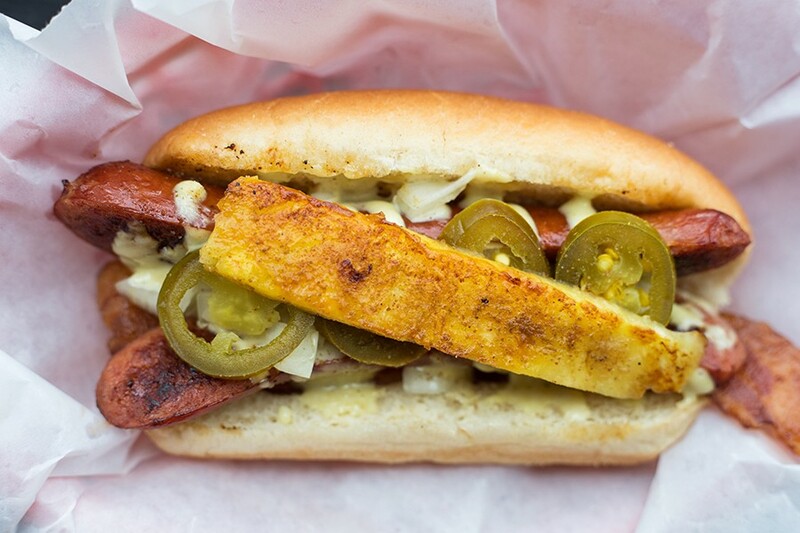 The punch of the fermented cabbage, the sweetness of the onions and the vinegary pop of mustard are like a beautiful symphony that enhances, rather than covers up, the delectable hot dog. 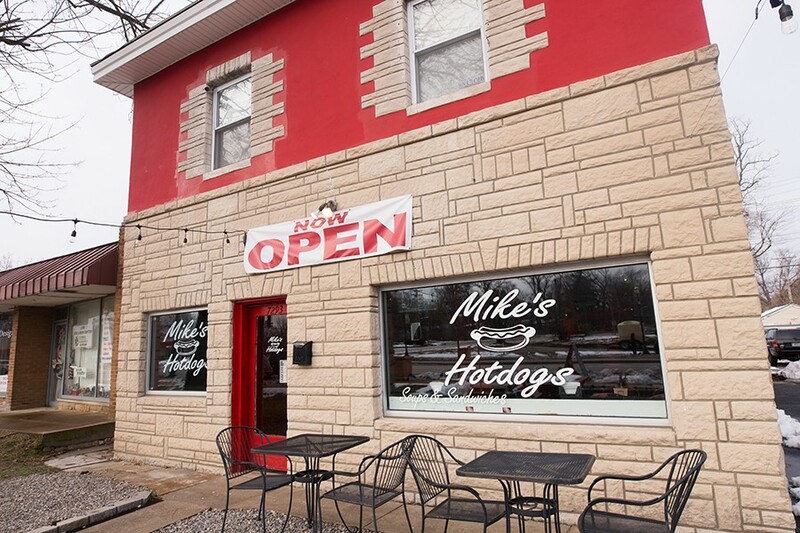 Though the name might lead you to believe otherwise, Mike's Hot Dogs is much more than a sausage shop. 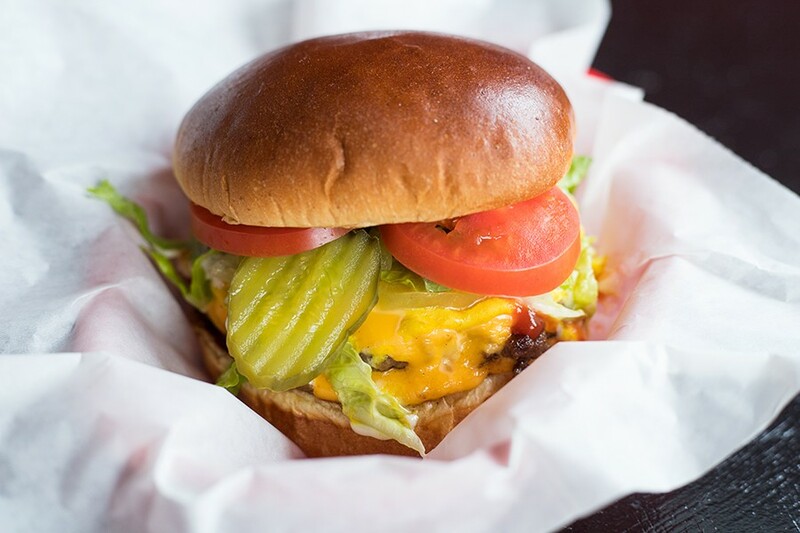 Eagan's outstanding burgers are plumper versions of griddle-style patties, but they still get that beautiful crispness around the edge. I opted for a double (you can even get a triple) with the works and was treated to a beautiful, juice-and-condiment-dripping-down-your-wrists mess of a burger, the ooze coming from greasy patties, gooey American cheese and caramelized onions that taste like they've been simmered in gravy. The triple Angus burger comes with caramelized onions, pickles and cheese. The fried cod, too, is a magnificent sandwich. Unlike all too many fried fish sandwiches, this is coated in thick breading, not beer battered, giving it a delicate, flaky texture. In place of tartar sauce, Eagan dresses his version in jalapeño aioli for just a snap of heat, then adds shredded lettuce and tomatoes. Mingled with the aioli, the vegetables act like a spicy coleslaw. Eagan's Texas-style chili has become one of his signature dishes over the years; once you've tasted it you realize why. The beefy concoction, made with minimal beans, is so thick you could eat it with a fork. There's a hint of traditional chili spices, but the main flavor component, aside from pure beef-and-tomato richness, is a subtle sweetness redolent of molasses, maple sugar or even cola. It's satisfying on its own, but he also serves it as a topping for magnificent, beef-filled tamales, also made by El Ray Cooked Meats. It's a glorious riff on chili and cornbread. A few of the offerings were not as successful. The restaurant's Cuban was not bad per se; in fact, the mix of smoky pulled pork and ham, dressed with cheese, pickles, mustard and barbecue sauce, was a tasty smokehouse sandwich. However, if you are expecting a traditional Cuban, you might be shocked by how far from tradition it deviates. I was also unimpressed with the club sandwich. I do not like hot club sandwiches in general, and this one reinforced my opinion. Thick slices of turkey and ham are piled onto grilled sourdough bread, along with bacon, Provel, jalapeño aioli and shredded lettuce. Hot lettuce is rarely a good thing outside of Jack in the Box tacos, and overall, the result here is a soggy, sliding mess. The flavors work, but the presentation is a problem. These misses were more than made up for by Eagan's best offering: the grilled steak sandwich. Hunks of tender meat and melted Provel mingle with a mix of caramelized onions and mushrooms; the mélange of cooking juices tastes like hearty gravy. All of this soaks into the sandwich's butter bun, infusing every bite with deep, beefy flavor that tastes like a cross between a pot-roast sandwich and a Philly cheesesteak. The eatery is located in University City. That sandwich may be served in a paper-lined red plastic basket from a counter-service hot-dog shop, but the flavors are as rich and developed as what you'd find at an upscale restaurant. And therein lies Eagan's genius. He didn't have to leave fine dining behind to live his passion; he simply had to apply his skill to a different format. And now hot dogs aren't just in his blood. Thanks to Mike's Hot Dogs, they're in our hearts.